Brooks Oliver received his MFA in Studio Art with a ceramics concentration at The Pennsylvania State University in 2014. While there he also taught and acted as the Ceramic Technical Assistant. He received his BFA in Studio Arts with ceramics and sculpture concentrations at Southern Methodist University in 2010, and then completed his post baccalaureate studies at Syracuse University in 2012. Next year, he will be a long term resident at the Archie Bray Foundation in Helena, Montana. He is represented by the Ro2 Art Gallery in Dallas, Texas. Growing up as an amateur magician since adolescence I have always been fascinated by illusions and love when the eye is tricked and the mind is boggled. I have identified three crucial aspects to creating a successful illusion; to make the viewer question their assumptions, to construct a context around how the viewer perceives what is happening, and to generate a moment where belief is suspended. 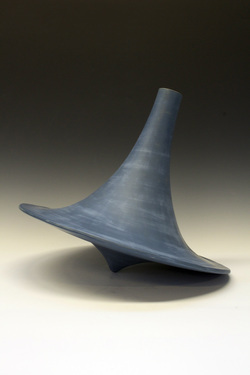 Within my own work, I use the ceramic vessel to convey my fascinations with these three aspects of an illusion. Like a parlor magician in a tuxedo or an illusionist on stage with a bedazzled cape with flashy lights, I set a stage and construct contexts around my forms. While they often tend to lean towards the dressy tuxedo side, my forms are often displayed in ways that provoke further inquiry regarding their performance and the anticipated environments where they are intended to reside. Partially influenced by my two years of undergraduate training in engineering, my work tends to incorporate elements of engineering and math through tight, minimalist forms revolving around simple geometries. As with any good magic trick, one takes something that is familiar or known to be true and then flips that assumption into something that is the opposite or the unfamiliar. With this in mind, I create elements of illusion in the forms, surfaces, and materials I use. Similarly, I strive to create illusions of form involving aspects of apparent movement, defiance of gravity, or elements of balance where the viewer in drawn in to closely inspect conflicting dualities of form. I am extremely interested when one’s visually perceived knowledge is contrary to that of known reality. The moment that is created by this disbelief, similar to that of someone seeing a magic trick, is one of childlike amazement. I personally take great joy in offering a viewer this experience.